How do you create a brand foundation? Knowem.com is an early step. 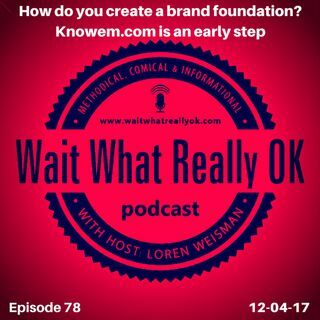 Wait What Really OK Podcast Episode 78 hosted by Branding Strategist and Keynote Speaker Loren Weisman discusses the early stages of creating a brand as well as what to do and what to avoid in the beginning. In the initial stages of branding a person, product, service or company, it can be an overwhelming and intimidating process. What ends up making it take more time and cost more money is when that process is not set in ... Más informaciones place with the right foundation. From using free online tools like Knowem.com to do your research and due diligence in the similarities in look, feel and even phrasings, the strongest steps made to build the most solid foundation will allow you to start your brand from the most stable place. So, how do you create a brand foundation? Knowem.com is an early step to take just as working to define the brand from look to feel to the written word. Why go backward? Set it up right to fuel it to move forward and upward effectively and professionally. Episode 78 “How do you create a brand foundation? Knowem.com is an early step.” of the Brand Management and Marketing Podcast Wait What Really OK is available on iHeartRadio. “Fully Licensed Wait What Really Ok Theme Song" by RKVC. “News and Information Podcast Percussion Outro” by Doug Hinrichs. Conducting Business at a Pub. The Sean Ryan Pub Speaker Series. Podcast Blog Supplement for Episode 78 of the Wait What Really OK Podcast with Loren Weisman. Podcast Link Supplement for Episode 78 of the Wait What Really OK Podcast with Loren Weisman. Use authentic channels and honesty to market your products to build authority. The Podcast video supplement for iHeartRadio’s Personal Branding Podcast, Wait What Really OK Episode 78. Podcast Photo Supplement for Episode 78 of the Wait What Really OK Podcast with Loren Weisman.